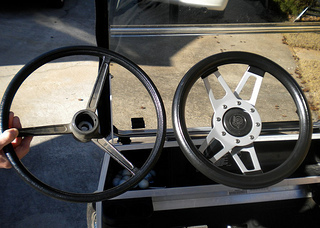 Golf cart steering wheels can add a custom look to your cart. 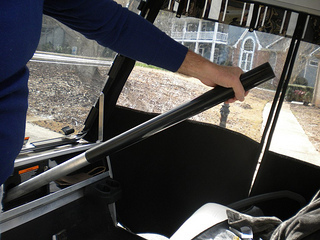 Replacing this golf cart part is quite easy and I'll take you through it step by step. 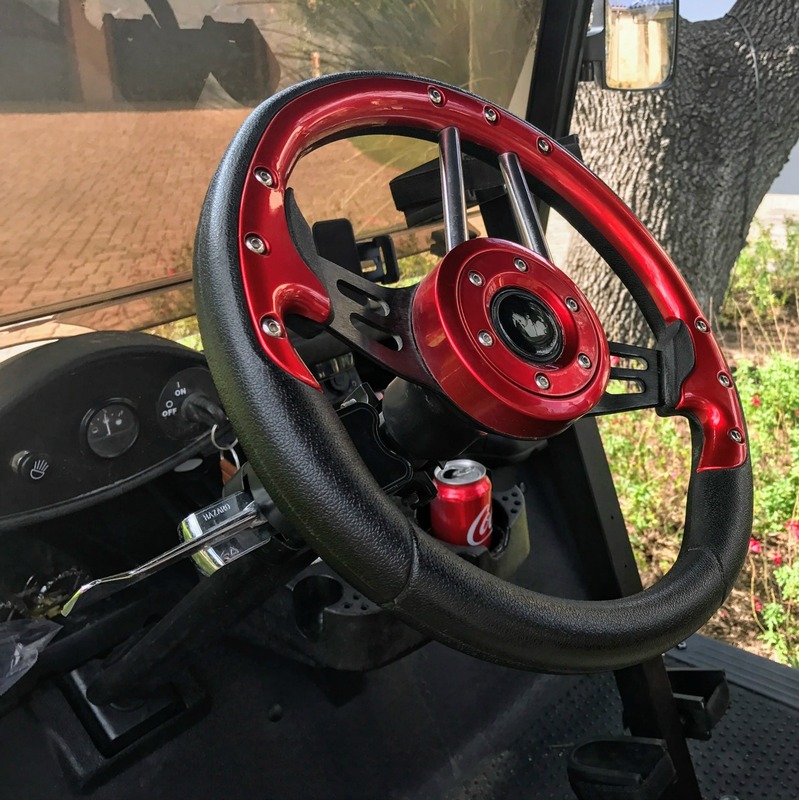 Since we bought our refurbished Club Car golf cart a year ago, I've been looking at upgrading the steering wheel to something more custom. Surprisingly it was my wife who actually picked out the new one and ordered it. I must say it looks really good. The number of spokes range from a simple two spoke, called a billet 2 spoke Typhoon steering wheel to 4 spokes. Besides the number of spokes, there are lots of different styles and finishes such as brushed aluminum to stainless steel.Mostly available in black or chrome. Personally, I like the chrome best. The basic steering wheels start at around $65 and can go up to $250. 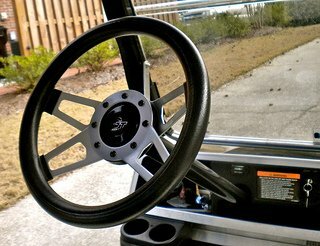 You will need to know the make, model and year of your golf cart to make your selection. Amazon has the best prices, best selection and best shipping deals. 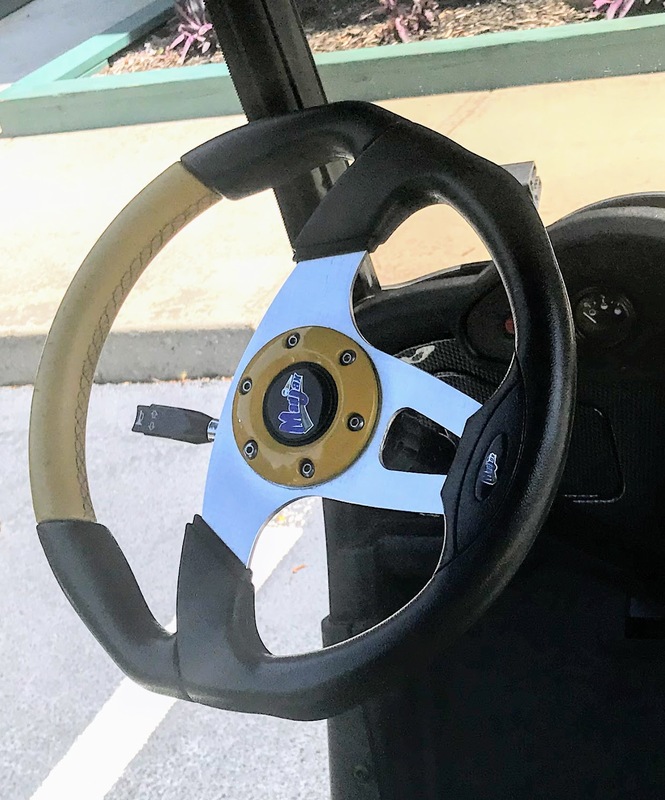 This 13" wheel has 3 spokes and fits Club, EZGO and Yamaha golf carts and comes in blue, black, carbon filter, chrome, red and yellow. 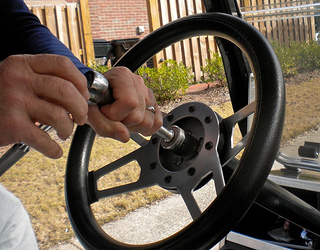 This golf cart steering wheel is specific to EZ Go golf carts. 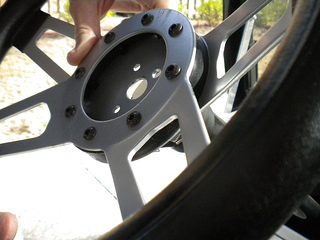 Made of brushed aluminum this accessory is designed to fit EZ Go golf carts with no adaptor needed. 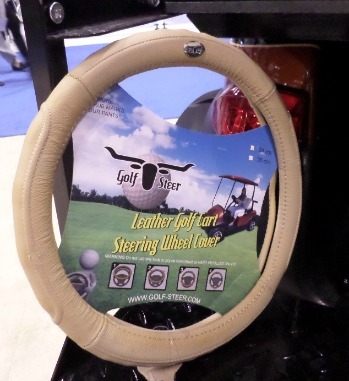 For a whole lot less money, you can purchase a steering wheel cover. The neoprene ones run around $20 and come in basic colors like black, dark grey or tan or in fun bright colors. All leather wheel covers like this one pictured are about $25. The sleeve is like a big paper towel tube that slides right over the column. 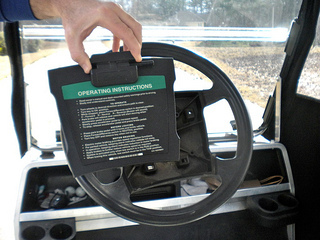 This golf cart part is specific to your make and model. Column covers come in black plastic or a highly polished stainless steel. They run around $30. I decided to keep the focus on the cool new steering wheel and leave the black column sleeve as is. 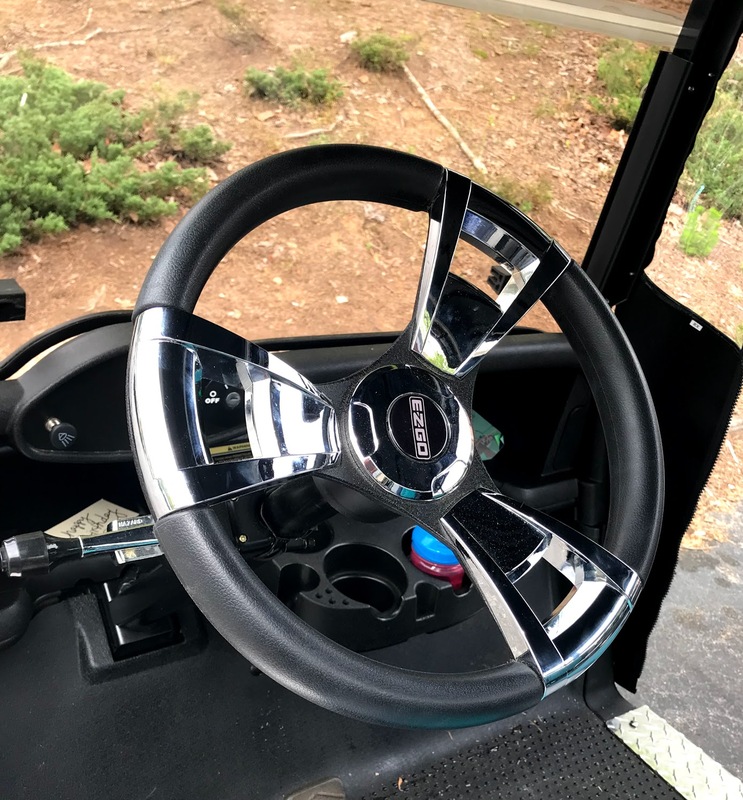 Club Car Golf Cart Stainless Steel Column Cover 24"
Yamaha Golf Cart Stainless Steel Column Cover 26.5"
Of course you can't just buy a new steering wheel, you also need to purchase an adapter kit to attach the new wheel to the golf cart column. Some on-line stores sell the steering wheel and the adapter as a kit which provides some savings. 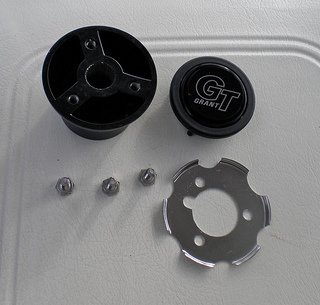 Remove the steering wheel plate/score card holder and unscrew the bolts that attach the wheel to the column. 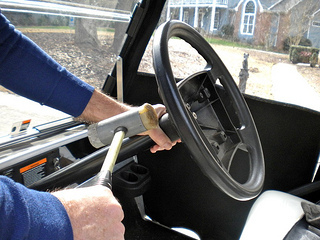 With a rubber hammer tap the old golf cart steering wheel to loosen it and then remove it from the column. Install the adapter pieces onto the steering wheel column. Align the holes from the adapter kit with the holes on the new steering wheel. 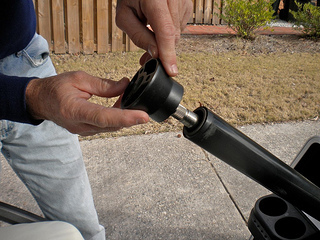 Tighten the bolts with a socket wrench. Pop in the plastic cap in the indented space.